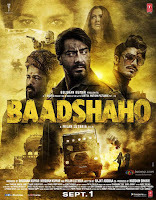 Baadshaho 2017 | FunToMovies 300 Movies '+g+"
Story line: Baadshaho is inspired by real-life events during the Emergency and revolves around stolen gold, a thief (Ajay Devgn), an army officer (Vidyut Jammwal), a character inspired by Maharani Gayatri Devi (Ileana D’Cruz). Maharani Gitanjali Devi (Ileana D’Cruz) from one of the Rajasthan’s Princely States has already lost her privy purse. The story revolves around a group of thugs who decide to loot the gold confiscated from Rani Gitanjali, and being transported to Delhi by road.